Queens, NY - The scramble to fill the seat of former Assemblywoman Audrey Pheffer has taken another turn, with her longtime aide announcing she will not run for the post. 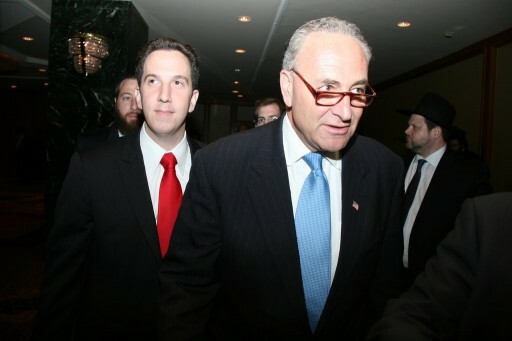 That clears the deck for Phillip Goldfeder, an aide to U.S. Sen. Chuck Schumer. Goldfeder is being touted as the Queens Democratic Party’s pick to replace Pheffer, who recently stepped down from her legislative post to become the Queens County Clerk. The district includes parts of Ozone Park, Howard Beach and the Rockaways. Shapiro said she made the decision not to run after having discussions with her family. Goldfeder, a Far Rockaway native, has worked for both Republicans and Democrats, including a stint on Mayor Bloomberg’s 2005 campaign and City Councilman Simcha Felder’s unsuccessful campaign for state Senate. I've met Phil a couple of times before, and have to say this is pretty exciting news! He's always been a great advocate for people of NY and if he goes for this seat, it will only be good news for us! Phil Goldfeder is a great asset to the Jewish Community and to the community at large. Hopefully he will get in. Why jews become Democrats is beyond me! #3: In NYC, Republicans rarely win elections. Since the Democratic nominee is usually a shoo-in, I'm a registered Democrat. That way I have some say (through the primary) as to who's going to hold office. If I don't like the Democratic nominee, I can vote for the Republican in November, but it's largely a protest vote. Hatzlacha to Phil. Great guy. Phil should become a Republican and run. Democrats are not the party they once were. No where near.